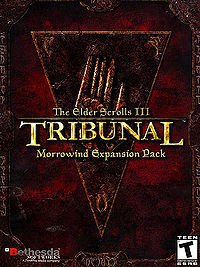 Tribunal is the first of two expansion packs for Morrowind, taking place in Mournhold, a Temple city inside the capital of the Dunmeri province of Morrowind. Two opposing forces seek to manipulate the Nerevarine to their advantage. The ruthless, newly crowned King Hlaalu Helseth seeks to firmly establish his authority, while the divine Almalexia is desperate to retain her grasp on the people. The machinations and intrigues of both sides draw the Nerevarine deep into the sewers, caves and ruins under Mournhold, and to a place lost to Tamriel itself. This page was last modified on 12 July 2017, at 12:13.